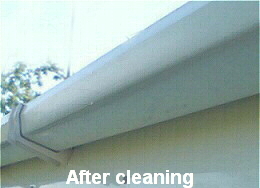 Remember when your UPVC guttering and fascias were gleaming white? Over time these plastics, which protect your home from the weather, gradually become dirty and unsightly as mould slowly builds up. This in turn, makes your property look run down. Which is a shame, because with regular cleaning (approximately once per year) the exterior of your property can be kept looking like new. It can also reduce the risk of damage and dampness caused by the spread of mould and mildew. 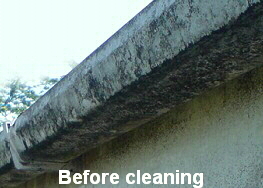 If required, Window Cleaning Services can maintain the original appearance of your UPVC guttering, fascias and soffits, and protect your property with a regular cleaning regime, and even help bring neglected fascias and soffits back to their original appearance. We also use environmentally safe and bio-degradable cleaning products during the cleaning process which are specifically designed to clean exterior UPVC surfaces. So you can be assured that we do not use chemically reactive or toxic cleaning products when you use our services. Ring now for a free quote!